LCGS stands for London Coins Grading Service, which offers a third party grading system based on a benchmark coin grading set, and fixed parameters which the graders follow which remain unchanged over time. The goal of the system is consistency over time and objectivity. Very significant increased value is put on coins that are considered to be in a higher grade of preservation than similar coins of a given type and the LCGS system has been designed to rank the grade of preservation of coins that are measured on the LCGS scale. Population statistics can then be published that will show the finest graded coin of a given type and date. The LCGS defines numeric grades between 1 and 100 and the following grades are in use. LCGS also attaches values to these grades based on historical price data that it gathers in the coin market. 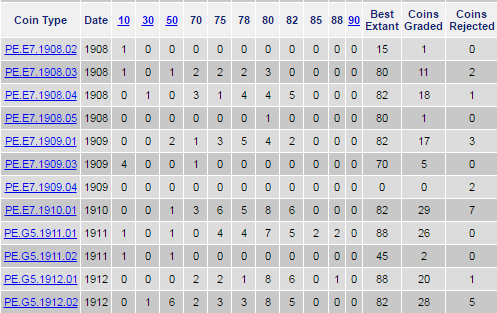 So also available in the LCGS section of our website are valuations by grade. Coins that are graded by LCGS are encapsulated in a tamper proof holder designed for long term storage. The holder also contains the attribution ticket. Storage boxes which neatly contain 20 LCGS encapsulated coins are also available. 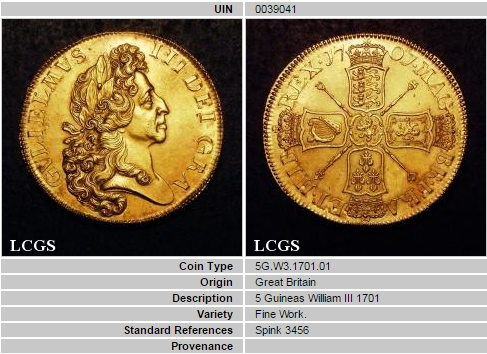 LCGS Members have access to their own web pages which give a wealth of information relating to LCGS graded coins such as population statistics and valuations by grade, as well as use of The My Page. For more information see the Menu.